The state of Texas is a vast land of tremendous variety. From the lush piney woods of East Texas to the semiarid deserts of West Texas, from the Gulf Coast to the High Plains of the Panhandle, the land, people, and legends of the Lone Star State have inspired an equally diverse group of painters and sculptors. 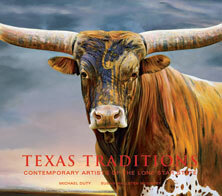 Texas Traditions brings together both historic and contemporary artists, showcasing their work in more than 200 images as colorful as the men and women who created them. Michael Duty, who selected the artists appearing in the volume, authors a lead essay on historic Texas artists from the mid-19th through the early 20th centuries. Susan Hallsten McGarry interviews 36 contemporary artists whose paintings and sculptures pay homage today to the Texas ethos and reveal artistic influences that compel each artist toward his or her unique style and voice. Texas Traditions is a library addition that refuses to stay on the shelf. Readers will enjoy endless hours of vibrant, moving imagery, Texas geography, and the kind of artistic personalities that reveal why Texas stands out as not only a place but also a persona.